[Y,E,U] = filter(Mdl,Z) filters errors to produce responses, innovations, and unconditional disturbances of a univariate regression model with ARIMA time series errors. [Y,E,U] = filter(Mdl,Z,Name,Value) filters errors using additional options specified by one or more Name,Value pair arguments. Regression model with ARIMA errors, specified as a model returned by regARIMA or estimate. The parameters of Mdl cannot contain NaNs. Errors that drive the innovation process, specified as a numObs-by-numPaths matrix. That is, εt = σzt is the innovations process, where σ is the innovation standard deviation and zt are the errors for t = 1,...,T.
As a column vector, Z represents a path of the underlying error series. As a matrix, Z represents numObs observations of numPaths paths of the underlying errors. filter assumes that observations across any row occur simultaneously. The last row contains the latest observation. Z is a continuation of the presample errors, Z0. Presample unconditional disturbances that provide initial values for the ARIMA error model, specified as the comma-separated pair consisting of 'U0' and a column vector or matrix. If U0 is a column vector, then filter applies it to each output path. If U0 is a matrix, then it requires at least numPaths columns. If the number of columns exceeds numPaths, then filter uses the first numPaths columns. U0 requires enough rows to initialize the compound autoregressive component of the ARIMA error model. The required number of rows is at least Mdl.P. If the number of rows in U0 exceeds the number necessary, then filter uses the latest Mdl.P presample unconditional disturbances. The last row contains the latest presample unconditional disturbance. Default: filter sets the necessary presample unconditional disturbances to 0. Predictor data in the regression model, specified as the comma-separated pair consisting of 'X' and a matrix. The columns of X are separate, synchronized time series, with the last row containing the latest observations. The number of rows of X must be at least numObs. If the number of rows of X exceeds the number necessary, then filter uses the latest observations. Default: filter does not include a regression component in the model regardless of the presence of regression coefficients in Mdl. Presample errors providing initial values for the input error series, Z, specified as the comma-separated pair consisting of 'Z0' and a vector or matrix. If Z0 is a matrix, then it requires at least numPaths columns. If the number of columns exceeds numPaths, then filter uses the first numPaths columns. Z0 requires enough rows to initialize the compound moving average component of the ARIMA error model. The required number of rows is at least model.Q. If the number of rows in Z0 exceeds the number necessary, then filter uses the latest Mdl.Q observations. The last row contains the latest observation. Default: filter sets the necessary presample errors to 0. NaNs in Z, U0, X, and Z0 indicate missing values and filter removes them. The software merges the presample data sets (U0 and Z0), then uses list-wise deletion to remove any NaNs. filter similarly removes NaNs from the effective sample data (Z and X). Removing NaNs in the data reduces the sample size. Such removal can also create irregular time series. All predictor series (i.e. columns) in X are associated with each error series in Z to produce numPaths response series Y. Simulated responses, returned as a numobs-by-numPaths matrix. Simulated, mean 0 innovations of the ARIMA error model, returned as a numobs-by-numPaths matrix. Simulated unconditional disturbances, returned as a numobs-by-numPaths matrix. Simulate responses using filter and simulate. Then compare the simulated responses. Both filter and simulate filter a series of errors to produce output responses y, innovations e, and unconditional disturbances u. The difference is that simulate generates errors from Mdl.Distribution, whereas filter accepts a random array of errors that you generate from any distribution. 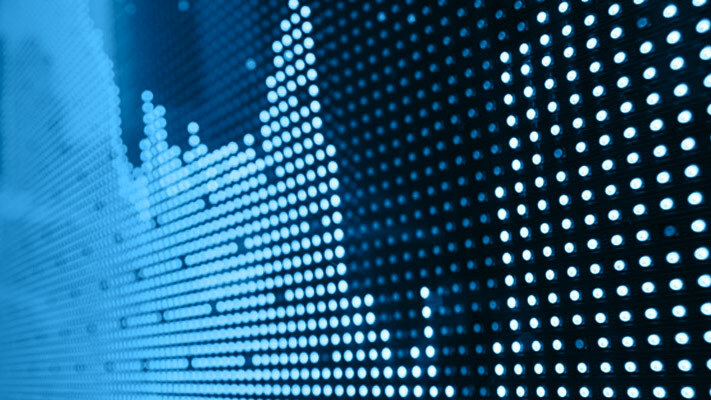 Simulate data for the predictors and from Mdl using Monte Carlo simulation. Standardize the simulated innovations and filter them. 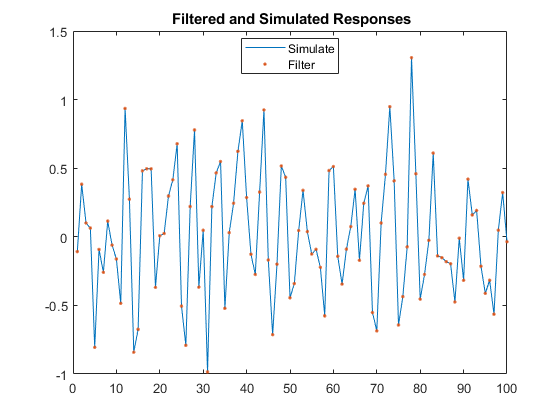 Confirm that the simulated responses from simulate and filter are identical using a plot. Alternatively, simulate responses by randomly generating your own errors and passing them into filter. This plot is the same as the previous plot, confirming that both simulation methods are equivalent. filter multiplies the error, Z, by sqrt(Mdl.Variance) before filtering Z through the model. Therefore, if you want to specify your own distribution, set Mdl.Variance to 1, and then generate your own errors using, for example, random('unif',a,b) for the Uniform(a, b) distribution. 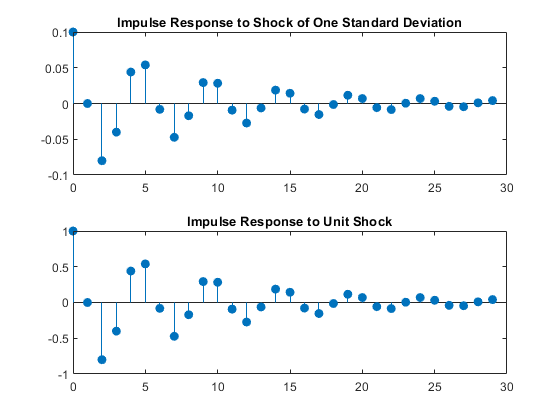 Simulate the impulse response of an innovation shock to the regression model with ARMA(2,1) errors. The impulse response assesses the dynamic behavior of a system to a one-time shock. Typically, the magnitude of the shock is 1. Alternatively, it might be more meaningful to examine an impulse response of an innovation shock with a magnitude of one standard deviation. The impulse response function is invariant to the behavior of the predictors and the intercept. The impulse response of the model is defined as the impulse response of the unconditional disturbances as governed by the ARIMA error component. When you construct an impulse response function for a regression model with ARIMA errors, you must set Intercept to 0. Simulate the first 30 responses of the impulse response function by generating a error series with a one-time impulse with magnitude equal to one standard deviation, and then filter it. Also, use impulse to compute the impulse response function. When you construct an impulse response function for a regression model with ARIMA errors containing a regression component, do not specify the predictor matrix, X, in filter. Plot the impulse response functions. The impulse response function given a shock of one standard deviation is a scaled version of the impulse response returned by impulse. Simulate the step response function of a regression model with ARMA(2,1) errors. 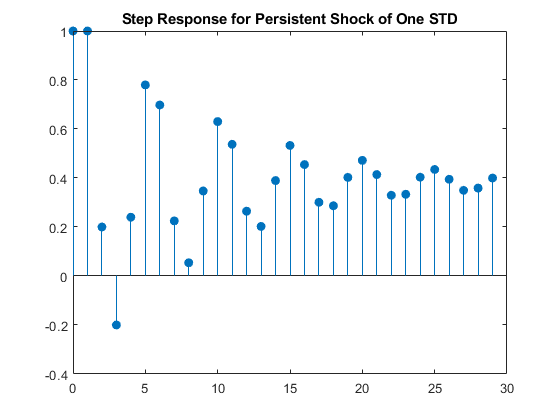 The step response assesses the dynamic behavior of a system to a persistent shock. Typically, the magnitude of the shock is 1. Alternatively, it might be more meaningful to examine a step response of a persistent innovation shock with a magnitude of one standard deviation. This example plots the step response of a persistent innovations shock in a model without an intercept and predictor matrix for regression. However, note that filter is flexible in that it accepts a persistent innovations or predictor shock that you construct using any magnitude, then filters it through the model. Simulate the first 30 responses to a sequence of unit errors by generating an error series of one standard deviation, and then filtering it. The step response settles around 0.4.
filter generalizes simulate. Both filter a series of errors to produce responses (Y), innovations (E), and unconditional disturbances (U). However, simulate autogenerates a series of mean zero, unit variance, independent and identically distributed (iid) errors according to the distribution in Mdl. In contrast, filter requires that you specify your own errors, which can come from any distribution.